Each stage can have its own unique target. 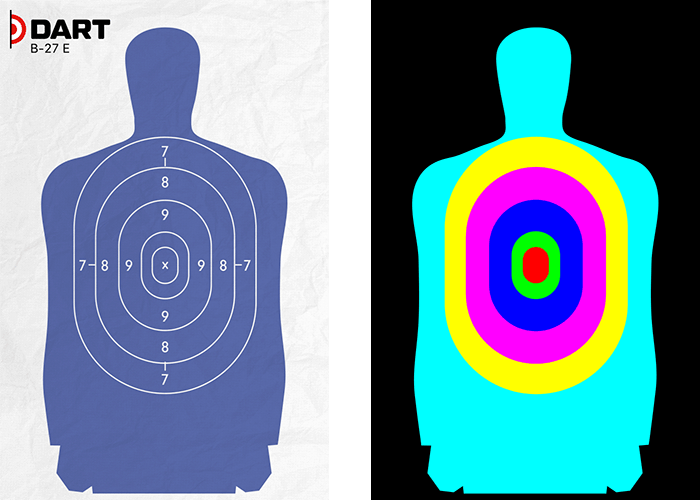 When we refer to a target in DART, we mean a combination of a target image (the part of the target the shooter sees), a zone image (a separate image which the computer uses to identify various scoring areas), scoring values, and sounds – all of which combine to create a target. The Targets menu provides options for selecting targets, defining a target’s movement, and other settings. The Targets menu has five options: Load Target, Behavior, Movement, Target Path, and Preferences. Opens a window that will load a selected target into the currently active target slot (1 through 10) as selected in the top navigation bar. 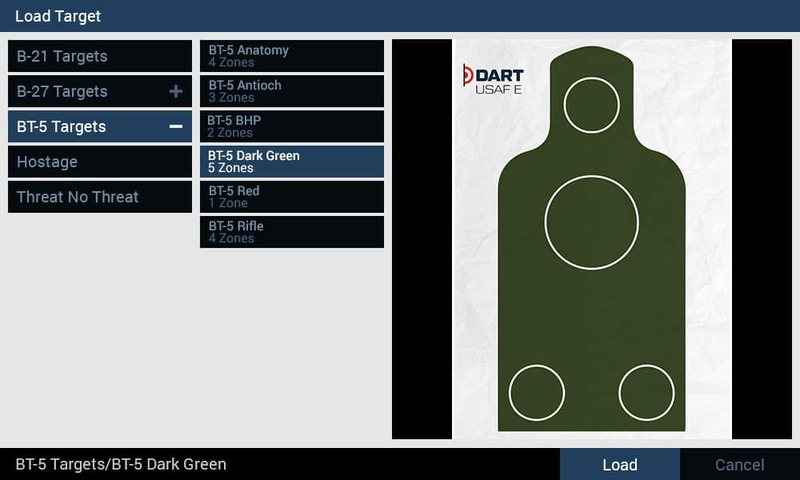 DART comes with more than 100 prebuilt targets, and it is possible to create your own using the Target Editor options. In DART, targets travel along 3D paths. In DART Studio, these paths are defined by at least 2 and as many as 10 waypoints. The Target Path commands allow you to place these waypoints anywhere you like by defining its horizontal and vertical position along with its distance from the shooter. Editing path waypoints happens in real time, meaning that as you change a waypoint’s position with the various sliders, you will see the target move as well. This makes it easy to place path waypoints exactly where you need them. Every target is assigned a default path with two waypoints but a path can have up to 10 waypoints. The waypoint controls allow you to add, delete, and move through path waypoints. When you select a waypoint, the target position will instantly update to the selected waypoint’s position. Once a waypoint is selected, you can edit its position using the Horizontal, Distance, and Height sliders. Deletes the currently active waypoint. All paths must have at least 2 waypoints, so when a path has 2 waypoints, this option will be inactive. The left arrow selects the previous waypoint. If waypoint 1 is selected, this option will be inactive. The right arrow selects the next waypoint. If the last waypoint is selected, this option will be inactive. Adds a new waypoint to the existing path behind the currently selected waypoint. Paths are limited to a total of 10 waypoints, so if a path already has 10 waypoints, this option will be inactive. Once a path is created you may want to save it for future use. Clicking the Save Path button will open a window that will allow you to save the current path to disk. Likewise, use the Load Path button to load a previously saved path. Loading path will completely replace the path for the current target with the loaded path. Once you load a path, the name of the path will appear above the load and save buttons. Note: You may notice an asterisk (*) appear next to the path name from time to time. This is an indication that you have made changes to the path since it was last saved. If you think you might want to use the path in other stages and course, you can use the Save Path options to save the path. Once a path has been created with the Target Path options, the Movement options allow you to control the speed of the target along the path. You can also set the beginning and end points as well as where the target will face as it travels. There is also an option for previewing target motion. Sets the starting position of the target along the path. If your target will not move (meaning Travel Time is set to 0), this will be the fixed position where the target will appear. The slider moves between 0 and 100. This sets the percentage of the path at which the target will start. For example, a value of 50% will start the target in the exact center of the path, while a value of 100% would start the target at the very end of the path. Like most options in DART Studio, the Start slider provides real-time feedback. Simply move the slider back and forth to see where the target will be at any given starting point. Also, notice that the yardage indicator in the title constantly updates to show you the target’s distance at the selected starting position. Sets the ending position of the target along the path. If your target will not move, this setting will be ignored. The slider moves between 0 and 100. This sets the percentage of the path at which the target will end. For example, a value of 50% will end the target in the exact center of the path, while a value of 100% would end the target at the very end of the path. Like most options in DART Studio, the End slider provides real-time feedback. Simply move the slider back and forth to see where the target will be at any given ending point. Also, notice that the yardage indicator in the title constantly updates to show you the target’s distance at the selected ending position. Sets the time it will take in seconds, to travel the distance set by the Start and End positions. Shorter travel times results in quicker target movement. A setting of 0 will prevent the target from moving. The Orientation button provides two options for setting the rotational value of the target as it moves along the path. There are two options: Facing and Path. The Facing option forces the target to always face the shooter. Using the Path option means that the target will always face forward (based on the direction of the path) as it travels along the path. Depending on the path, this could mean that the target will sometimes appear sideways to the shooter. The Preview option allows you to test the motion of a target or targets while you are working with the motion commands. This is very useful for test target speed. There are two options: One Target and All Targets. Selecting One Target will only preview the motion of the currently selected target, no matter how many targets are in the scene. All Targets will preview the motion of all targets in a stage. This allows you to test target interaction. Target behaviors allow you to control what happens to a target when it begins life and defines trigger events that can cause new behaviors at some point in the simulation. This option describes the starting behavior of a target. A target may be Visible, Hold, Rotate In, or Pop Up just prior to movement (if any). Hold is a special behavior that will cause a target to remain in place, even if it is assigned motion along a path until a trigger event happens. the Hold option works in conjunction with the Action called Release. A Trigger is an event that causes a predetermined Action to happen. A trigger event can be based on time, distance, shots fired, or specific hits. A simple example might be that we want a target to fall down if it is hit in the bullseye. In this case, the Trigger is a Zone Hit (a hit in a specific area of the target), and the Action is Fall Down. Or suppose you wanted a target to stop moving once it was 5 yards away from the shooter. In this case, the Trigger would be Distance (5 yards) and the Action would be Freeze. You might not always want a Trigger to happen at an exact moment. There may be times when you want to add an element of unpredictability. For this reason, most triggers let you set parameters for a trigger event. For example, we can instruct a target to stop moving when it is between 5 and 10 yards from the shooter. The following section describes the four types of behavioral triggers: Time, Distance, Any Shot, and Zone Hit. The Time trigger uses parameter sliders for Starting Time and Ending Time, which can be set between 0 and 30 seconds. These sliders establish the period at which the trigger will occur. If both sliders are set the to the same value – for example, 10 – the trigger event will happen precisely 10 seconds after the beginning of the stage (not including instruction and countdown time if any). However, if the sliders are set to different values – for example, 15 and 30 as shown here – the trigger event will happen at a random point between these two times. Note: The time slider cannot exceed the max time for the stage. For example, if your stage has a time limit of 15 seconds, the maximum value of the time sliders will be 15 seconds. The Distance trigger uses parameter sliders for Near Distance and Far Distance. These sliders establish the distance from the shooter at which the trigger will occur. Both sliders have values between 3 and 25 yards. If both sliders are set the to the same value – for example 10 – the trigger event will happen at the first point the target is 10 yards away from the user. However, if the sliders are set to different values – for example 10 and 25 – the trigger event will happen at a random point between these two distances. The Any Shot trigger uses parameter sliders for Low Shot Count and High Shot Count, which establish the period the trigger will occur. Both sliders have values between 1 and 50 shots. If both sliders are set the to the same value – for example 10 – the trigger event will happen as soon as any 10 shots are fired, regardless of whether the shots are hits or misses or any combination. If the sliders are set to different values – for example 10 and 20 – the trigger event will happen at a random point between 10 and 20 shots. Note: The shot count sliders cannot exceed the max shots allowed for the stage. For example, if your stage has a time limit of 20 shots allowed, the maximum value of the shot count sliders will be 20. The Zone Hit trigger sliders are used to specify Shot Count and Target Zone. These two sliders determine how many shots in a specific zone must occur to trigger an action. The Shot Count slider has a value between 1 and 10 shots. The Target Zone slider has a value between 1 and 8. If the Shot Count slider is set to 5 and the Target Zone value is set to 8, the trigger event will happen as soon as any 5 shots strike the #8 zone of the target. Note: The Shot Count slider cannot exceed the total shots allowed for the stage. Note: The Target Zone slider only reflects the zones available in the target. When a trigger condition is met, an Action is initiated. There are five possible actions: Freeze, Fall Down, Release, OTX Wide, and OTX Narrow. Causes the target to stop where it is and discontinues all further motion. Rotates the target backward 90° (the opposite of Pop Up). If a target is being held in place by the Hold starting option, this action will release the target and begin its movement along a path. This allows a target’s motion to be delayed. Fires a wide burst laser from the OTX box. Fires a narrow burst laser from the OTX box. Note: The OTX device is optional hardware consisting of a laser emitting box and laser detecting belt worn by the shooter. Using the OTX, the DART system can “shoot back” at the shooter and is useful for practicing “off the X” and cover drills. The Preferences menu allows you to set shot requirements for ending one stage and moving to the next. This is done by defining zone hit requirements. For example, you might require two hits to a target’s head area before moving on. In addition, you can add a recoil effect to the target. DART targets may have up to eight hit zones. These zones are defined by colored areas in a target zone image. The zone selection boxes allow you to specify which target zones the shooter must hit before advancing to the next stage. An image of the target and target zone are shown in the main viewport so that you can easily determine which target zone should be selected. Click a colored box to select the associated target zone. Note: All three rules and requirements; ammo, time, and zone hit requirements operate on a “whichever occurs first” basis. For example, if you have Max Shots Allowed set to 10 and Max Time Allowed set to 0:03 seconds, the stage could end at 0:03 seconds even if the shooter has not fired a single shot. The Simulated Recoil slider shifts the target position after each hit. The higher the value, the more the target will move. A setting of zero effectively turns this option off. This is a way of compensating for the lack of recoil in most laser training weapons, forcing the shooter to reacquire the target after each shot.